It was yum but a bit crumbly, fally-aparty. It's a new recipe. It'll need a bit of milk next time to make the mix wetter and stick it together. We ate it between the 2 of us over the course of a few days. Piggy wiggies!! 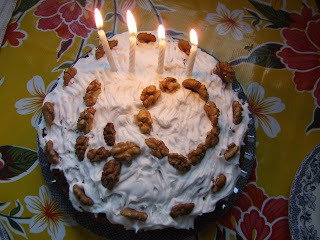 Do you like the walnut 40!!? ?